In some cases, it is more convenient to reuse a previously prepared document by copying it instead of generating it from a template. In JungleDocs, you can use Copy Source not only to copy the original document content along with metadata but to also apply settings from the associated rule (e.g., file naming automation or dynamic saving path). 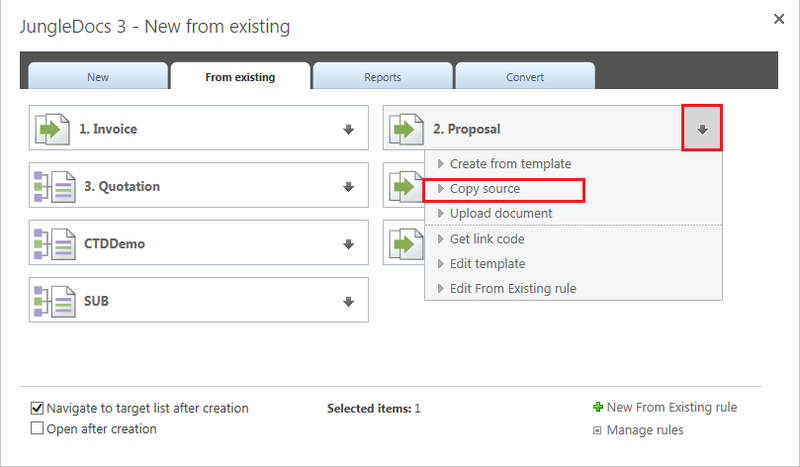 You can find the Copy Source option in the drop-down menu of any From Existing rule after you have selected a document. If the source document has content controls inserted and filled with metadata, then in the document which was generated from it, the content controls will be updated according to metadata changes.